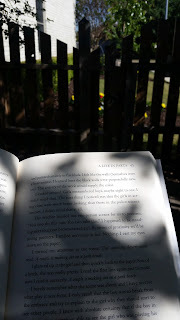 I'm happy to say that it's been a beautiful weekend filled with family and fun...and perfect weather for reading on my patio. And because it's been such a lovely weekend, I've spent very little time indoors and no time on my laptop. I did, however, want to pop on here and tell you that I'm currently reading Bryan Cranston's memoir, A Life in Parts. The book is exactly what the title describes. Cranston takes us through his life with small stories that say much more than just the words on the page. It's interesting to read stories about another person's life and understand what shaped them and made them the way they are. I appreciate his candor and his sense of humor. I also appreciate his talent as a good storyteller. I hope you enjoyed a fabulous weekend, wherever you are, and you're ready and refreshed for the new week. I also hope you found time to enjoy a good book or two.